Place bones, stew meat, onion, celery, carrots, and garlic in a shallow roasting pan. Drizzle with olive oil and bake for 45 minutes, turning halfway through. If the bones begin to char, reduce heat as charring will add a burnt flavour to the stock. With a slotted spoon, transfer meat, bones and vegetables to a large stock pot or Dutch oven. Place roasting pan over two elements on medium heat. Pour in red wine and de-glaze the pan with a metal spatula scraping up all the brown bits and juices. Transfer to the stock pot. Add peppercorns, bay leaves, parsley, cloves and porcini mushrooms. Cover the solid ingredients with 16 cups of cold water. Over medium high heat, slowly bring to a light boil. Reduce heat to the lowest setting and loosely cover the pot. Cook for a minimum of three hours, although the longer you cook it the more flavourful your stock will be. I cooked mine for 10 hours. Do not stir the stock while it cooks, as this will make it cloudy. Occasionally check on the stock for as it cooks fat and scum will rise to the top. Skim the fat with a spoon and discard. When the stock has finished cooking, remove the bones, vegetables and other solids with a slotted spoon. Line a sieve with cheesecloth and strain the broth into a bowl or large sealable container. Cover and refrigerate overnight. 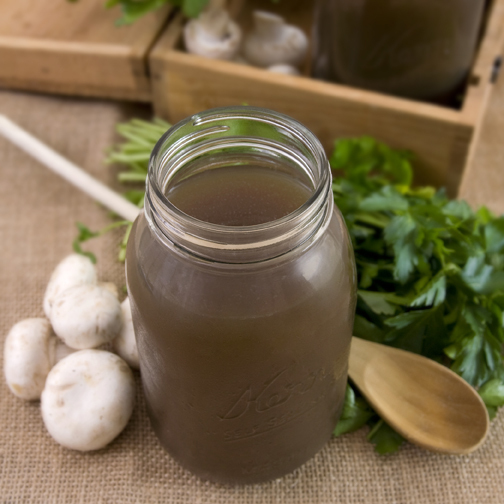 When the broth has cooled completely, all the fat will have solidified on top. Use a large metal spoon to remove the fat. Either discard or save it in the fridge for cooking. 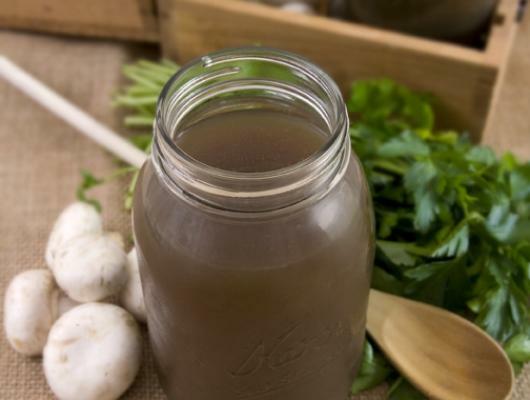 Store beef stock in a sealed container. Refrigerated, the stock will last about 4-6 days. If frozen, it will last about 3 months.